Bamboobino offers you a unique, award-winning line of children's clothing, bedding, bathtime towels and accessories made from super-soft, rayon from bamboo, plus nursing pads for mom too! Textiles made from rayon from bamboo are more absorbent than cotton. Its cashmere-like softness is great for babies. It comfortably wicks moisture away from skin. It's hypoallergenic - suitable for newborn's sensitive skin. It's easy to care for - all Bamboobino baby clothes can be machine washed and tumble dried. Bamboobino fabrics are blended with certified organic cotton. Organic cotton has low impact on the environment. It is grown using no toxic pesticides or fertilizers with methods and materials allowed in organic production. Bamboo fiber is softer than the softest cotton. The viscose from bamboo fiber in all Bamboobino products are Oeko-Tex 100 certified, and is made from OCIA & USDA-certified organically grown bamboo. 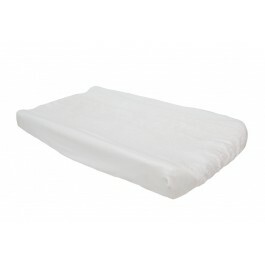 The organic cotton in their products are also OCIA-certified. All the products are made in Vancouver except the socks, crib sheets and pandas, which are sourced ethically in Asia. Whenever possible, they use local suppliers. I generously received the Change Pad Cover. It fits standard change pad (31" x 16" x 4")(78.7cm x 40.6cm x 10.2cm) and the change pad cover has a thick terry centre for an extra comfortable diaper change. I am a huge fan of bamboo and organic cotton products because they are made without pesticides and fertilizers and are so safe for sensitive skin like my son has and like newborn babies have! That is why I am so excited to feature Bamboobino and all their bamboo baby products! I just love that they care so much about children and the products they are selling for children! I absolutely LOVE the changing pad cover I received from Bamboobino! I was using an icky, old pad cover I think I got at a garage sale a couple years ago and it was neither soft nor safe for my son's skin like this awesome bamboo changing pad cover! If you are looking for the safest and softest material for your children's room and wardrobe, then make sure to head over to the Bamboobino website and check out all their amazing bamboo products! Buy It: You can purchase the Change Pad Cover for $40.00 on the Bamboobino website. Win It: Bamboobino is generously offering (1) $40 gift certificate to a lucky winner!